Observation - Chanterelle - UK and Ireland. Description: The Chanterelle season has started, I know it may not be PC on a nature study site, but we do eat them up here. this group we have been harvesting for over 10 years now. 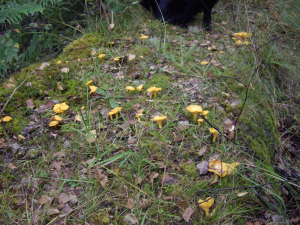 The Chanterelle season has started, I know it may not be PC on a nature study site, but we do eat them up here. this group we have been harvesting for over 10 years now.